Airbrush makeup is highly pigmented makeup that is applied using an airbrush. You will find out the pros, cons, and where on the net you can find it! The airbrush tool compresses air, then uses this air to blow the makeup solution onto the skin. This air mixes with the makeup liquid. More pressure turns the liquid into very tiny droplets that land on the skin in the form of a fine mist. The layer of color on the skin is very thin, while the color itself is very deep. So the airbrush enables you to have very good coverage, without the caking that would come with conventional makeup. It's interesting to know that artists used to get commissioned to edit a picture, and it would end up looking fairly real. So the evolution of airbrushing on canvas, to pictures, then the skin itself was bound to happen. Although airbrushing is not a new technology, it is a slightly recent trend in the mainstream makeup market(2012). So at the moment, airbrush makeup kits are still quite pricey. Accessibility is also an issue, because most airbrush systems must be shipped from the US,UK, etc... This increases the price even more for online buyers outside of these areas. The color in airbrush makeup is very concentrated. This makes it a wonderful choice for women(or men) who want maximum coverage. This includes skin conditions such as rosacea and vitiligo, or cover-ups for permanent tattoos. The reason why the makeup is so popular with the tv crowd, is that it covers so well. It makes skin still look awesome under HD scrutiny. This is unlike most regular makeup, which doesn't cover up enough to look perfect on huge HD screens. You can see people's pores if they're not well filled in. The makeup is also long lasting, which makes it good for functions( hence the popularity for weddings) and even for everyday work. You don't have to be taking touch up breaks, or end up looking faded at the end of the day. The easy blending that the systems enable is one of it's best features. Kits come with foundations in a certain colour range. You can then mix and match easily in the feed cup to end up with your perfect match. This is especially awesome for black women with a complexion that might not be the same all over the face. For example, if your forehead is slightly darker than your cheeks, you can match the foundation to each part, so that your face doesn't look ashy in some places while perfect on others. Another plus is that the range of makeup products that can be applied with it is quite extensive. You can have your foundation, blush, bronzer, tanner, and eye makeup colors all in airbrush makeup form. They are also easily exchanged in the feed cup by washing it and putting in the next product. Being able to apply all your makeup with one tool is convenient. Airbrush makeup formulations are composed of a few basic ingredients that make most makeup products what they are. Many of the foundations are oil free, water based formulas. Solvents are used to suspend the other ingredients that are going to stay on the skin, while it then evaporates after the makeup has been applied. They can range from water, to alcohol. Most airbrush makeup is water based. The alcohol base is often used for body paint variations. Pigment gives the makeup it's most important attribute. It's colour! As has been mensioned, the concentration of pigments in the makeup is much higher than for other makeup. Resin helps the pigment stick to the skin. Other additives are put into the formula to preserve the makeup, so that bacteria isn't able to live in it. There's also additives that are there to perform certain actions on the skin. For example, anti ageing makeup may have extra ingredients to keep skin supple. Where Will you Find Your Kit? The first step when thinking about airbrushing is the airbrush makeup kit. You need trustworthy tools. Once you have found the airbrush system that matches your wallet, the actual makeup is a matter of your skin's needs. Find out what foundation works best for your skin type and tone. Here is a list of airbrush makeup manufactures you can start the search for your HD self... Perhaps you can find one in your area or order online. Dinair is a seasoned player in the airbrush makeup sphere, and is based in the US. 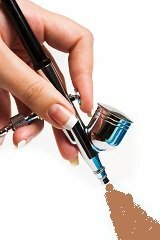 They offer a really huge selection of retail airbrush products, from foundation to tanning products. Luminessair are UK based and also offer retail consumers an extensive range of home airbrush systems and makeup. Temptu is a US based manufacturer. They also offer a retail makeup range for consumers. Kryolan Professional makeup is a German based manufacturer, with an international presence. Amongst a broad makeup array, they carry an airbrush make up line geared mainly at professional makeup artists, but you can still check it out if they have a base near you. Graftobian is a US based manufacturer with worldwide distribution. They have a range of both cosmetic and body art makeup.